The PrintWorks shop has been providing competitively priced, high quality stationery to the students of Wilmslow High School for over 10 years. We use our knowledge of the academic year, curriculum and time-tables to create a range of products which will assist our students achieve their potential and meet the high standards Wilmslow High School expect. Our shop and photocopying services are available from 8.30am to 4.30pm Monday to Friday. 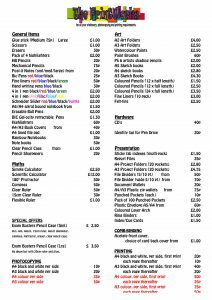 We also offer students an excellent colour and black and white printing facility, along with laminating and comb-binding.